DAI Classroom includes programme options for children in three groups (early primary, late primary, and secondary). There are several different choices for each age group: Treasury of the World, Story of Amricani, and Amricani Cultural Centre. Each programme is approximately 90 minutes, accommodates up to 30 children, and can be done in English or Arabic. 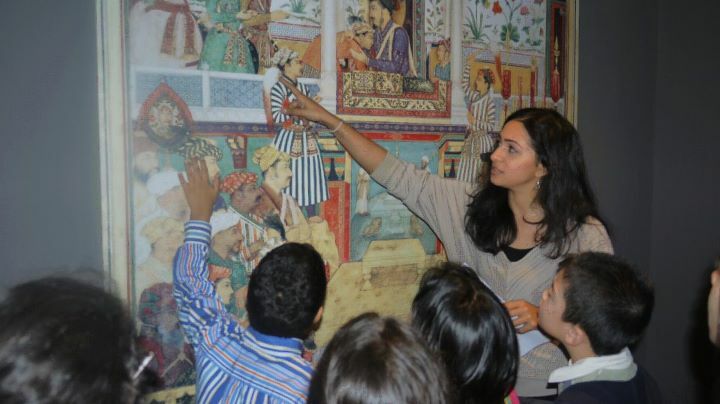 The Treasury of the World sessions include an introduction to Islamic art, a tour of the Mughal jewellery exhibition, a discussion of time, place and context, and a hands-on project related to what the students have seen and heard. Story of Amricani sessions include a viewing of the Story of Amricani exhibition, a tour of the compound (but not the Mughal jewellery exhibition), and a discussion of the history of the American medical mission in Kuwait in the early 20th century. An interactive project is also included in these sessions. The Amricani Cultural Centre programme includes an introduction to Islamic art, an overview of the American medical mission in Kuwait in the early 20th century tours of both the Treasury of the World and Story of Amricani exhibitions and a question and answer session at the end. Sessions will be booked on a first come: first served basis. Teachers, please let your school administration know and try to make the most out of this great resource. Parents, speak to your children's teachers about this ASAP and let them go ahead and book a visit.